A gordita (Spanish pronunciation: [ɡorˈðita]) in Mexican cuisine is a pastry made with masa and stuffed with cheese, meat, or other fillings. It is similar to a pastry and to the Colombian/Venezuelan arepa. Gordita means "chubby" in Spanish. There are two main variations of this dish, one which is typically fried in a deep wok-shaped comal, consumed mostly on center and south Mexico, and another one baked on a regular comal. The most common and representative variation of this dish is the "gordita de chicharrón", filled with chicharron (a spiced stew of pork rind) which is widely consumed throughout Mexico. Gorditas are often eaten as a lunch meal and accompanied by several types of salsas. A gordita is typically prepared as a thick tortilla. The dough is most commonly made of nixtamalized corn flour, as also used for tortillas, but can also be of wheat flour, particularly in northern Mexico close to the U.S border. An old variant of corn gorditas uses masa quebrada (broken dough) where the corn meal is coarsely ground, leaving bits of broken grain. In the deep fried version, once the masa has been prepared, it is separated in small portions, then each one is filled with meat, and shaped as an oblong disc. The Pastry is immersed in boiled oil until golden and crispy on the outside. After cooking, the gordita is allowed to stand to drain excess oil, then a small slit is cut into one side to allow vapor and excessive heat to release and pour lime juice and salsa inside, which gives the gordita its characteristic flavor. In some regions of Mexico, the slit is also used to stuff additional ingredients, mostly dressings such as fresh cheese, nopal salad, tomatoes, guacamole, potatoes, beans or rajas (sautéed strips of chile). By tradition, gorditas are filled with chicharron, but there are local variations which substitute it by chicken stew, shredded beef, carne al pastor, eggs with chorizo sausage, carnitas or picadillo. The baked version is prepared almost identical as a common tortilla, except it is thicker. When the masa is prepared, chicharrón is mixed directly in the dough, instead of being added later. Shaped as a flat circle, then it is placed in a comal until cooked, in most cases not adding additional oil. When slit and filled, this gordita looks like a sandwich made with tortillas instead of bread. This variation is known as Gordita de migas. 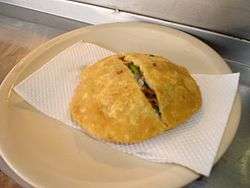 A Veracruz style gordita, typical from East Coast of Mexico. In central Mexico, gorditas commonly range from being relatively small, but bulky (about the size of a child's fist) to about the diameter of a "regular" tortilla. In northern Mexico they tend to be larger and flatter. In most cases gorditas are shallow fried with vegetable oil in a deep comal, but they can also be deep fried, making the outside more crisp. In Durango and others states of Northern Mexico, gorditas are commonly made from wheat flour and look like small pita breads. The dough (masa) is identical to that of a wheat flour tortilla. It is cooked on a comal with a hot piece of metal placed on top that resembles a clothes iron. The gordita fills with steam, and a small slit is cut into one side where it can be filled with guisados. The Salvadoran dish pupusa is similar to a gordita, except completely sealed and typically served with curtido, a lightly pickled cabbage relish. In Venezuela and Colombia an arepa (a type of corn bread) is often served stuffed with various ingredients. 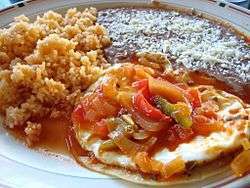 It is prepared in similar way as a mexican gordita, except the final dish is smaller and slimmer. By tradition, are served with a cabbage topping. In eastern and central Mexico "gorditas de nata" (cream gordita) are consumed often as breakfast dish or snack. It is a sweet cake similar to a tiny, but extremely thick pancake made with milk cream or clotted cream, called nata in Mexico, cinnamon, sugar and white wheat flour. They are named "gordita" too, due to their appearance, similar to the original fried gordita, but their taste is sweet, not salty. Besides their appearance, this snack is not related in any way with the original one. The same flour preparation used to prepare gorditas de nata is also used to cook a flat cookie variation, which by extension it is also named "gordita", but in contrast it is thin and crispy, not thick. To differentiate it, these flat cookies are named "sugar gorditas" instead. ↑ Rick Bayless, JeanMarie Brownson & Deann Groen Bayless (2000). Mexico One Plate At A Time. Scribner. pp. 40–50. ISBN 0-684-84186-X. ↑ Mark Busby (2004). The Southwest. Greenwood Publishing Group. p. 253. ISBN 9780313328053. Retrieved 6 March 2013.